Before you build a canvas app in PowerApps, you specify whether to tailor the app for a phone or a tablet. This choice determines the size and shape of the canvas on which you'll build your app. After you make that choice, you can make a few more choices if you select File > App settings > Screen size + orientation. You can choose portrait or landscape orientation and screen size (tablet only). 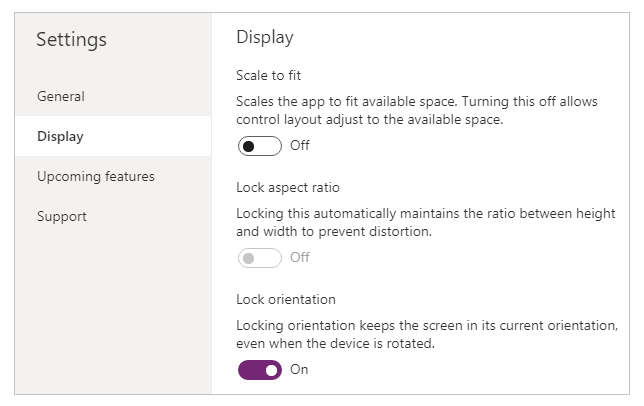 You can also lock or unlock the aspect ratio and support device rotation (or not). Those choices underlie every other choice you make as you design screen layouts. If your app runs on a device of a different size or on the web, your entire layout scales to fit the screen where the app is running. If an app designed for a phone runs in a large browser window, for example, the app scales to compensate and looks oversized for its space. The app can't take advantage of the additional pixels by showing more controls or more content. If you create a responsive layout, controls can respond to different devices or window sizes, making various experiences feel more natural. To achieve responsive layout, you adjust some settings and write expressions throughout your app. You can configure each screen so that its layout adapts to the actual space in which the app is running. To make your app responsive, you must take additional steps, but this change is the first step toward making responsiveness possible. 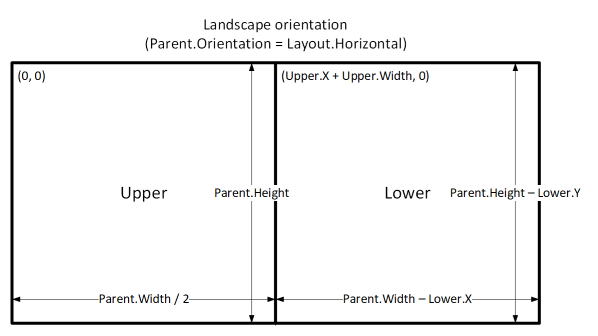 To make your app's layouts respond to changes in the screen dimensions, you'll write formulas that use the Width and Height properties of the screen. To show these properties, open an app in PowerApps Studio, and then select a screen. The default formulas for these properties appear on the Advanced tab of the right-hand pane. 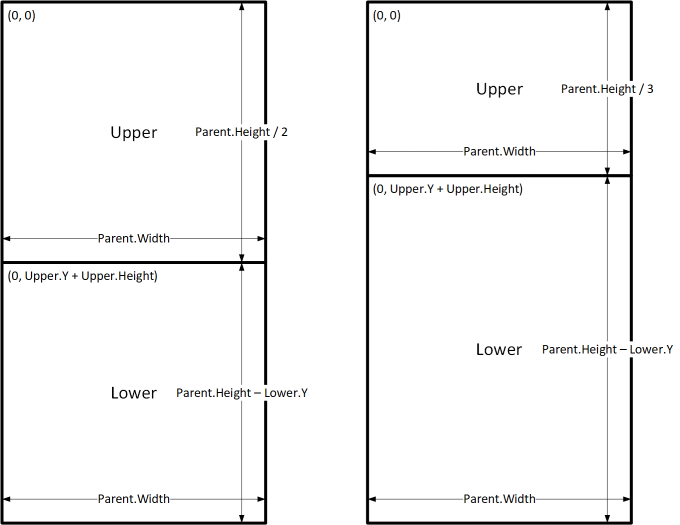 These formulas refer to the Width, Height, DesignWidth, and DesignHeight properties of the app. The app's Width and Height properties correspond to the dimensions of the device or browser window in which your app is running. If the user resizes the browser window (or rotates the device if you've turned off Lock orientation), the values of these properties change dynamically. The formulas in the screen's Width and Height properties are reevaluated when these values change. The DesignWidth and DesignHeight properties come from the dimensions that you specify in the Screen size + orientation pane of App settings. For example, if you select the phone layout in portrait orientation, DesignWidth is 640, and DesignHeight is 1136. As they're used in the formulas for the screen's Width and Height properties, you can think of DesignWidth and DesignHeight as the minimum dimensions for which you'll design the app. If the actual area available to your app is even smaller than these minimum dimensions, the formulas for the screen's Width and Height properties ensure that their values won't become any smaller than minimums. In that case, the user must scroll to view all of the screen's content. After you establish your app's DesignWidth and DesignHeight, you won't (in most cases) need to change default formulas for each screen's Width and Height properties. Later, this topic discusses cases in which you might want to customize these formulas. To create a responsive design, you locate and size each control by using formulas instead of absolute (constant) coordinate values. These formulas express each control's position and size in terms of the overall screen size or relative to other controls on the screen. After you write formulas for the X, Y, Width and Height properties of a control, your formulas will be overwritten with constant values if you subsequently drag the control in the canvas editor. When you start to use formulas to achieve dynamic layout, you should avoid dragging controls. These formulas use the Parent operator. For a control placed directly on a screen, Parent refers to the screen. With these property values, the control appears in the upper-left corner of the screen (0, 0) and has the same Width and Height as the screen. Later in this topic, you'll apply these principles (and the Parent operator) to position controls inside other containers, such as galleries, group controls, and components. As an alternative, the control can fill only the top half of the screen. 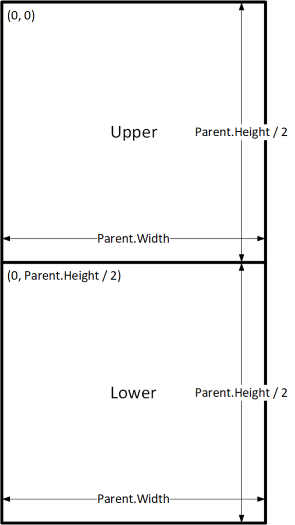 To create this effect, set the Height property to Parent.Height / 2, and leave the other formulas unchanged. This configuration would achieve the effect that you want, but you'd need to edit each formula if you changed your mind about the relative sizes of the controls. For example, you might decide that the top control should occupy only the top one-third of the screen, with the bottom control filling the lower two-thirds. 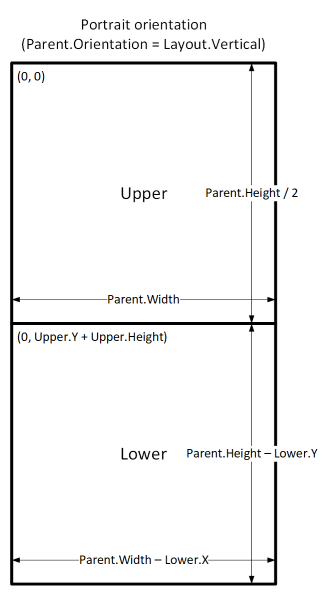 With these formulas in place, you need only change the Height property of the Upper control to express a different fraction of the height of the screen. The Lower control automatically moves and resizes to account for the change. You can use these formula patterns for expressing common layout relationships between a control, named C, and its parent or a sibling control, named D.
As you construct screens that contain more controls, it will become more convenient (or even necessary) to position controls relative to a parent control, rather than relative to the screen or a sibling control. By organizing your controls into a hierarchical structure, you can make your formulas easier to write and maintain. 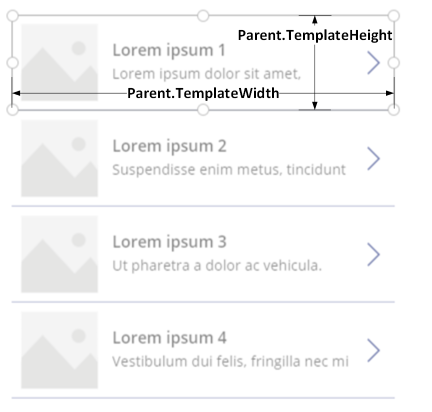 If you use a gallery in your app, you'll need to lay out controls within the gallery's template. You can position these controls by writing formulas that use the Parent operator, which will refer to the gallery template. In the formulas on controls within a gallery template, use the Parent.TemplateHeight and Parent.TemplateWidth properties; don't use Parent.Width and Parent.Height, which refer to the overall size of the gallery. You can use an experimental feature, the enhanced Group control, as a parent control. To turn this feature on, select File > App settings > Advanced settings. For the Header control, Parent refers to the screen. For the others, Parent refers to the Header control. Having written these formulas, you can adjust the size or position of the Header control by changing the formulas for its properties. The sizes and positions of the child controls will automatically adjust accordingly. If you use another experimental feature, named Components, you can construct building blocks and reuse them throughout your app. As with the Group control, the controls that you place within a component should base their position and size formulas on Parent.Width and Parent.Height, which refer to the size of the component. More information: Create a component. So far, you've learned how to use formulas to change each control's size in response to the available space, while keeping controls aligned relative to each other. But you might want or need to make more substantial layout changes in response to different device sizes and orientations. When a device is rotated from portrait to landscape orientation, for example, you might want to switch from a vertical layout to a horizontal one. On a larger device, you can present more content or rearrange it to provide a more appealing layout. On a smaller device, you might need to split up content across multiple screens. The screen's Width property is set to Max(App.Width, App.DesignWidth). The app's Width (1136) is larger than its DesignWidth (640), so the formula evaluates to 1136. The screen's Height property is set to Max(App.Height, App.DesignHeight). The app's Height (640) is smaller than its DesignHeight (1136), so the formula evaluates to 1136. With a screen Height of 1136 and a device height (in this orientation) of 640, the user must scroll the screen vertically to show all of its content, which might not be the experience that you want. These formulas swap the app's DesignWidth and DesignHeight values, based on whether the device's width is less than its height (portrait orientation) or more than its height (landscape orientation). After you adjust the screen's Width and Height formulas, you might also want to rearrange controls within your screen to better use the available space. For example, if each of two controls occupies half of the screen, you might stack them vertically in portrait but arrange them side by side in landscape. You can use the screen's Orientation property to determine whether the screen is oriented vertically or horizontally. In landscape orientation, the Upper and Lower controls appear as left and right controls. This formula evaluates to true when the size is medium or larger and false otherwise. This formula sets the control's width to half of the screen width on a small screen, three-tenths of the screen width on a medium screen, and a quarter of the screen width on all other screens. You can customize your app's breakpoints by changing the values in the app's SizeBreakpoints property. Select App in the tree view, select SizeBreakpoints in the property list, and then edit the values in the formula bar. You can create as many breakpoints as your app needs, but only sizes 1 through 4 correspond to named screen sizes. In formulas, you can refer to sizes beyond ExtraLarge by their numeric values (5, 6, and so forth). You can also specify fewer breakpoints. For example, your app might need only three sizes (two breakpoints), so the possible screen sizes will be Small, Medium, and Large. The authoring canvas doesn't respond to the sizing formulas created. To test responsive behavior, save and publish your app, and then open it on devices or in browser windows of various sizes and orientations. If you write expressions or formulas in the X, Y, Width, and Height properties of a control, you'll overwrite those expressions or formulas if you later drag the control to a different location or resize the control by dragging its border.